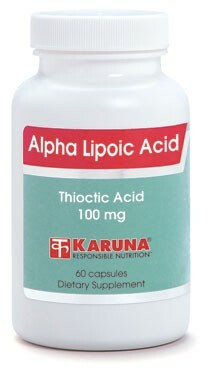 Alpha Lipoic Acid (ALA) plays a key role in energy metabolism and acts as a multifunctional antioxidant in both water and lipid-soluble domains. ALA has been used for years in Europe for its ability to support normal glucose regulation and nerve and eye function. ALA also functions as a key intermediate in oxidative decarboxylation for energy producing reactions, and it facilitates enhanced antioxidant potential with glutathione, ascorbic acid & vitamin E.
Alpha-lipoic acid (ALA) is often referred to as the "universal" antioxidant because it is both fat and water-soluble, it combats a wide variety of free radical reactions, and because it can regenerate other antioxidants back to their active state (Gen Pharmacol 1997;29:315-31; Free Rad Biol Med 1995;19:227-250). ALA is well-documented in human clinical research for its ability to support normal nerve function (Exp Clin Endocrinol Diabetes 1999; 107:421-30). ALA supplements also have direct benefits for blood sugar regulation according to human research (Diabetes Care 1999;22:280-7; Free Radic Biol Med 1999;27:309-14). Antioxidant protection of the eyes by ALA has been reported in both human (Vestn Oftalmol 1995;111:6-8) and animal (Biochem Biophys Res Commun 1996;221:422-429) studies. Animal research demonstrates that ALA can protect tissues from the damaging effects of oxygen deprivation (Brain Res 1996;717:184-188). Suggested use for adults: 1-3 capsules, once or twice daily, taken with meals, or as directed.